A large office supply company pioneered the idea of an easy button – one push and all your challenges fade away. What if you could make your trip to Canada’s national parks easier? Banff National Park staff has been trying to simplify outdoor adventures. Last year Parks Canada launched Equipped Camping sites – a tent with sleeping pads is set up and waiting, removing the need to buy camping gear or stressing over how to assemble tent poles. At Two Jack Lakeside campground in 2013 Parks Canada constructed oTENTiks – sturdy tent/cabin hybrids to keep the rain out and your bones off the ground. Both initiatives have been popular – the oTENTiks are fully booked most of the summer – and now the Red Chairs are coming to Banff National Park. The idea for the chairs came from Gros Morne National Park where pairs of red Adirondack-style chairs were installed hoping visitors would sit and ponder great views. The chairs were so popular, “there were line-ups to sit in some the chairs,” recalled Greg Danchuk, Visitor Experience Manager at Banff National Park. 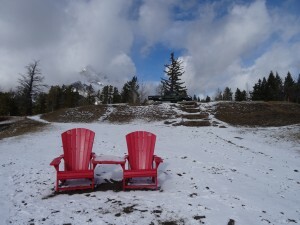 Now visitors can relax in the red chairs at several locations in Banff National Park such as the Hoodoos interpretive trail or at the Valleyview picnic area. “We placed them in places that are very easy to get to,” said Danchuk. There are nine pairs of chairs in the park with the possibility of adding more. What if you could make your trip to Canada’s national parks easier? Click to Tweet. Discover how @BanffNP is simplifying outdoor adventures for you and me. Click to Tweet. Discover how @ParksCanada is attracting new visitors with this unique & easy way to camp. Click to Tweet.